← West Coast Mingles/Singles by Stan Bober. 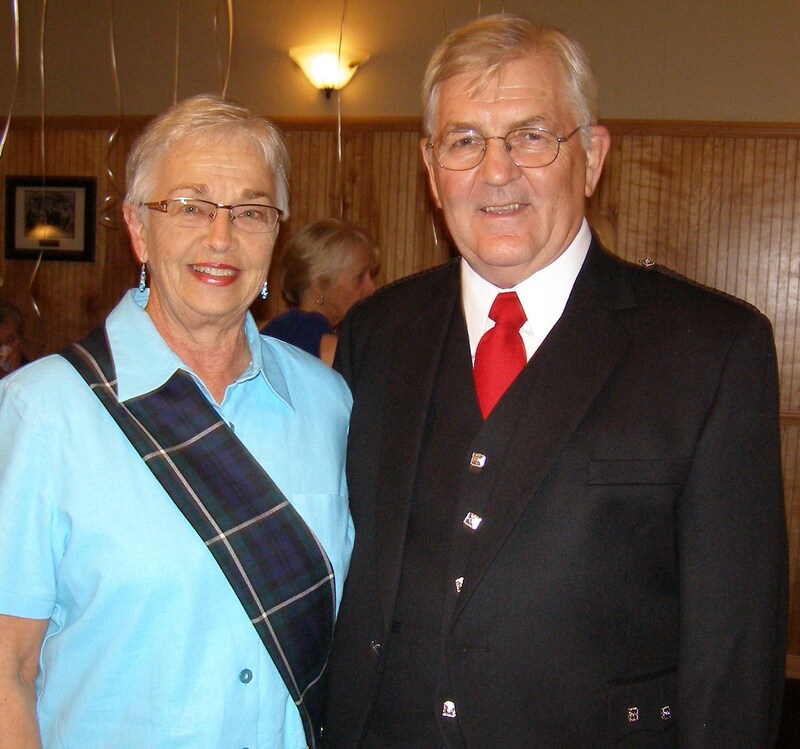 Glenna Earle Reports From Nova Scotia on Canada’s East Coast!! 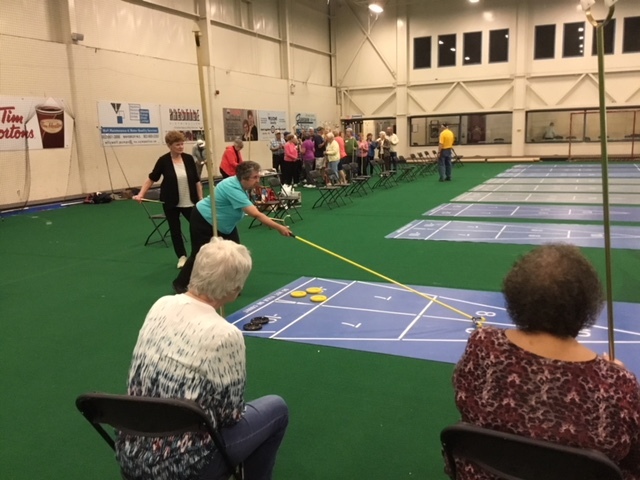 Glenna Earle Speaks: Today we had the pleasure of introducing 11 new ladies to the game of shuffleboard. 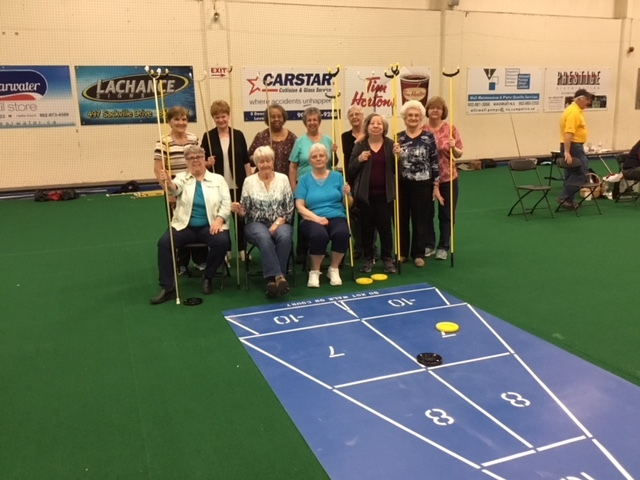 They came from a seniors group called Chebucto Links, with the idea they would like to try the game. I have been told there are as many more who want to come and try it as well. We had an extra court available today which we used as our instructional court. David and I gave a workshop on how to play the game and spent a fair bit of time on the actual approach and shooting technique which I think will “pay off”. These lovely ladies were thrilled with the fact that they could actually place a disc somewhere near where they wanted it to go. They continued to work at shooting discs until lunch time. We (the regulars) always stop for about 1/2 hour to eat our lunch which we bring with us, but today we were treated to a beautiful catered lunch which the Seniors club provided. We thank them sincerely for a delicious lunch. I had thought the ladies were coming for the AM only but after lunch one of the gals asked if they could stay on and play some more. We said of course you can and we gave them 2 courts to practice on while we went on with Hoss Collar. The women stayed until we were about finished for the day. I checked in on them occasionally and they were improving as the day went on. Almost every woman came and expressed their gratitude for teaching them the rudiments of the game and said they wish to return. We hope to see them back. We may do this all over again with a 2nd group soon. So pleased to have the opportunity to promote our sport to such a wonderful group of ladies and hope to see them again very soon. Submitted by Glenna Earle. Click on any pic to expand. 2018 06 19. 4 Responses to Glenna Earle Reports From Nova Scotia on Canada’s East Coast!! Fantastic work you guys are doing by sharing your experience and knowledge with others. When newcomers are taught the proper way to play the game I believe they always enjoy it more and tend to stay in the program as a result. “kudos” TO GARY PIPHER for a most appropriate and encouraging comment!!! That is what it is all about. Teaching is so rewarding, in seeing the enthusiasm and laughter in new comers. Great promotion efforts, we also have had a lot of new members join our club this year. Maureen Bryan, Centre Wellington. Great news from our friends in Nova Scotia. 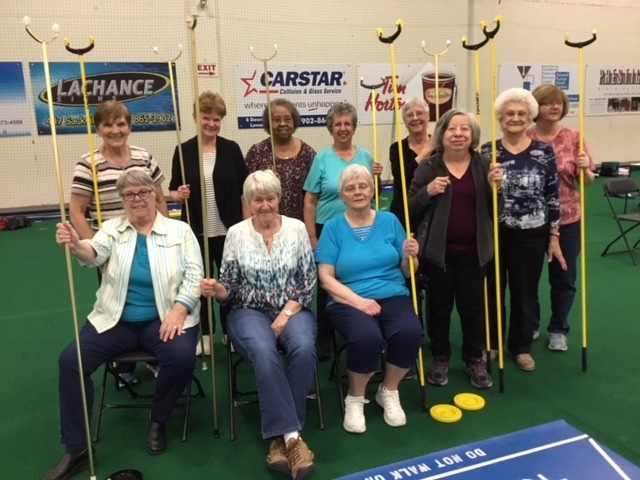 These ladies are very lucky to have Glenna & David teaching them to play shuffleboard. Keep up the good work of promoting and teaching this game of shuffleboard that we love to play. See you soon in High River.